Apple and IBM this week merged strengths in a new way to target the education market. 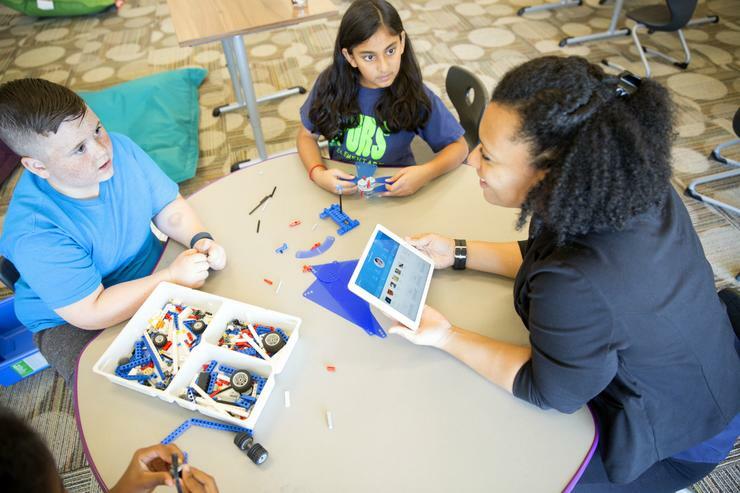 IBM Watson Element for Educators, a new iPad app from the companies, is designed to provide teachers with a more holistic view of students' academic progress, accomplishments, interests and learning activities in grades K-12. IBM began working on the initiative in 2013 and accelerated development following its 2014 partnership with Apple, which led to the creation of the MobileFirst for iOS program. The companies want to remake the educational experience for teachers and students by coupling IBM data, analytics and cognitive computing with Apple's design and user experience, according to Chalapathy Neti, vice president of education innovation for IBM Watson. Watson, IBM's cognitive technology, pulls from three data classes to align curriculum with students' proficiencies and interests, as recorded by educators, Neti says. IBM Watson Element for Educators uses recorded behaviors and interests to provide insight on students' proficiencies, to determine the types of personalized content and learning environments that might best engage them, according to Neti. The app is not a system of record for educators but rather a portal through which teachers can access, manipulate and gain insights from various data sets, Neti says. Data used by the app can exist in multiple systems, as is the norm with most school districts, including the Coppell Independent School District (ISD) in Texas, the first academic institution to use Watson Element. Apple and IBM will work with schools to integrate relevant data into the app, so educators can keep tabs on students' learning paths and record observations about their preferred learning styles, to eventually build customized plans that improve over time, according to Neti. "Even before a student takes any form of assessment, [educators] can actually through interests and historical learning deliver some personalized advice and intervention to those children," he says. Marilyn Denison, assistant superintendent for curriculum and instruction at Coppell ISD, says teachers who have access to the app save time and make use of data in ways that weren't previously possible. "There's a lot of information educators need to really build a relationship, but that information is usually stored in different files or data warehouses, and it's hard for educators to get all of that information quickly and concisely," she says. "If you don't give the educator the time or all of the resources they can't take that child's learning experience deep enough to do those things that we want to do." Roughly 150 educators across four schools in Coppell ISD are currently using Watson Element, and the district plans to have the app in the hands of all of its teachers by next year, according to Denison. Those teachers have had access to iPads for about three years, so the tablet and some iOS apps are already a natural part of their lesson designs, Denison says. The app "will change lesson design and student engagement," which are two of the district's highest priorities, according to Denison. "If we can engage students we know they're going to learn at a deeper level. We're more interested in the rigor and the deepness we can take kids in their learning more than how much we can cover. We want to learn deep." Educators can also integrate curriculums or other published material, including lesson plans, textbooks, videos and open-sourced data, to further customize their district's instance of Watson Element, according to Alex Kaplan, global education sales lead for IBM Watson. "From an instructional perspective there's really no limit in terms of the kinds of instructional materials that they can provide," he says. "Watson is also able to use natural language processing to align it to the standards and give insights to teachers about which piece they should choose" for each particular student, Kaplan says. "When a teacher is looking for a great piece of content for a student working on Algebra, Watson helps guide it to her." The new iPad app is available to educators at a per-year, per-student price, plus a one-time setup cost that includes integration with school districts' existing curriculums, databases and technologies, according to Kaplan. IBM didn't disclose pricing details beyond this general model. Denison at Coppell ISD says teachers are thrilled about the opportunities Watson Element brings. "I've had teachers in tears, and the comments I'm hearing are things like, 'Oh my gosh, this is so transformational. It's not just reforming my day, because reforming just makes my day better. This transforms my work,'" she says. "I think this has the potential to change education the way that we know it today."